Be the first to share your favorite memory, photo or story of Judith K.. This memorial page is dedicated for family, friends and future generations to celebrate the life of their loved one. 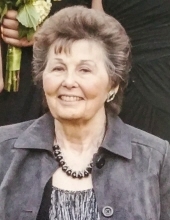 Judith K. "Judy" Beal, age 79, of Machesney Park, passed away peacefully Saturday, March 30, 2019 at Wauconda Care, Wauconda, Illinois. Judy was born on February 23, 1940, in Monroe, WI., to Orville and Lois (Rehberg) Houghton. A long time resident of Machesney Park, Judy absolutely loved living on the Rock River. During those years, she enjoyed many outdoor activities which included boating, fishing, golfing and just spending time outdoors. Judy was a very loving mother, grandma and great grandma. Her family and their time together was Judy's most valued treasure. She was loved by many and will be greatly missed by all. Judy is survived by her daughters, Teri (Mark) Deets, Kari (James Leslie) Seargent; grandchildren, Josh (Jill) Deets, Alysa (Russ Hallberg) Deets; great grandchildren, Maxwell, soon to be Baby Deets #2; sister, Barbara (Donald Ebert) Schwartz; brothers, Thomas (Mary) Houghton, Roger (Janettie) Houghton; many nieces and nephews and her special companions, Mitzi, Kolbe and Olive. Preceded in death by her parents and sister, Patricia Campbell. Memorial to the American Diabetes Association in Judy's name would be greatly appreciated at www.diabetes.org. A Celebration of life for Judy is currently pending and to be scheduled for a later date. To send flowers or a remembrance gift to the family of Judith K. "Judy" Beal, please visit our Tribute Store. "Email Address" would like to share the life celebration of Judith K. "Judy" Beal. Click on the "link" to go to share a favorite memory or leave a condolence message for the family.